On completion of the training, the therapists would be able to operate in a corporate call centre environments where they would take on internships. On the completion of internship, they will be fully qualified Corporate Chair massage therapists. Says Gareth Pritchard, BPeSA Western Cape CEO: “Health and wellness are critical issues to consider as it affects call centre staff productivity and therefore directly affecting our industry’s bottom line. The partnership between BPeSA Western Cape and the Ubuntu Touch Project assist to bridge divides in economic opportunities for women from marginalised communities and bring practical wellness solutions to Cape Town’s call centres”. Over the next four weeks we will be keeping you up to date on the progress of the Ubuntu Touch Project training incumbents, their stories, learnings and experiences. As the Ubuntu Touch training programme wrapped up its second week of training, it is becoming clear that the massage training provided by the programme is much more than a new skill for 12 women from Nomzamo outside of Cape Town. The building of a sense of community, the expansion of skillsets as well as the healing that the trainees bring to each other and their community in Nomzamo is evident. The project, supported by BPeSA Western Cape, is targeted at women from areas of high levels of unemployment, low skills base and stress and tension within communities like Nomzamo. The second week of the Ubuntu touch training followed the same timetable as the first week, with Taariq teaching the women theory in the mornings and practical in the afternoons. Taariq says that having Nomando, a qualified Ubuntu Touch therapist, as a class assistant and translator, has been invaluable. He tells how she has come up with games for the women to learn the difficult names of the various muscles in the anatomy. Friday saw the end of the training with Taariq who has been amazed at how the women from Nomzamo have applied themselves and how much they have grown in confidence. In week three, the women will be learning Indian head massage and on Thursday and Friday, they have their first paid work, with Capita, who are treating their staff to a Valentine special. The Ubuntu women are very excited at this opportunity. Each trainee will be given a book for recipients of the chair massage to sign and comment in. The Ubuntu Touch Women started off the fourth week with a renewed sense of confidence. ‘’Working at Capita was very good for our self-esteem,’’ said Bongiwe, speaking to Ian Macfarlane, director of the Medi-Spa academy in their Monday morning meeting. After the meeting, the day continued with training in foot massage by Chinese medical massage expert Louis Tunlu in the morning. In the afternoon they did case studies with Taariq Dien, who has been teaching oil massage. By Friday the women were in a very good space. Most of them had been selected from the Nomzamo township by the city and were extremely stressed when they arrived on their first day. ‘’My stress is going,’’ said Ncusimo. Asanda and Bongiwe say that they have found a lot of inner healing since beginning the course. Much of this is through the work that they are doing on others. All the women from Nomzamo have returned to the community hall where they were staying after being evicted, to treat the people who are still there. There are still over 300 people waiting to be rehomed. ‘’We just put a mattresses on chairs and everyone comes and waits for their turn.’’ Said Phakama. The rest of the women from Nomzamo agreed with this sentiment and said that they were going to continue giving massages at the community centre. These were just a few of the comments written by the many grateful employees of Capita when the Ubuntu Touch Women visited their offices to provide chair massage to the workers as a Valentine’s gift from their bosses. The faces of the Capita employees receiving their massages, were further testimony to the skills and dedication of the twelve ladies. The praise was well deserved. Having completed two weeks of oil massage and the theory of anatomy and physiology, Pearl Mpange and Nomonde Dyasi, former Ubuntu Touch students, taught Indian head massage for three days intensively. 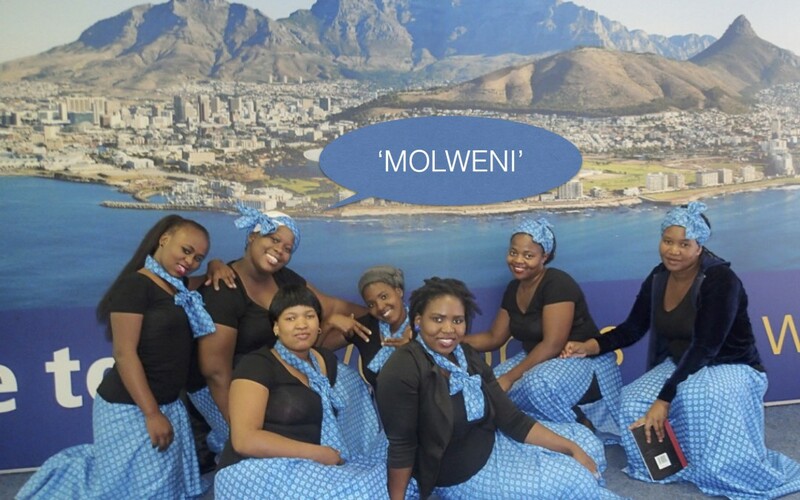 The Ubuntu Touch women looked beautiful as they arrived at Capita, in their matching blue traditional Swhe Shwe skirts and headscarves. This being their first paid job, there were nervous as well as excited, and keen to get started. The ‘’massage station’’ was set up in the two separate canteens at Capita, so the woman were divided into two groups of six. The staff at Capita needed little encouragement and for the next few hors none of the chairs were empty for long. There is much research-backed evidence on the benefits of chair massage in the work place, (http://dreamclinic.com/workplace-massage/benefits). Thursday and Friday, these were seen in action on the blissed out faces of the Capita staff and their enthusiastic comments. On the Friday, senior staff members had their end of week meeting, sitting in a circle each of them receiving a massage. The Ubuntu touch ladies left Capita brimming with excitement and confidence. While waiting for their taxi, they excitedly read each other’s comments from their books. Pearl looked around at the beaming girls.